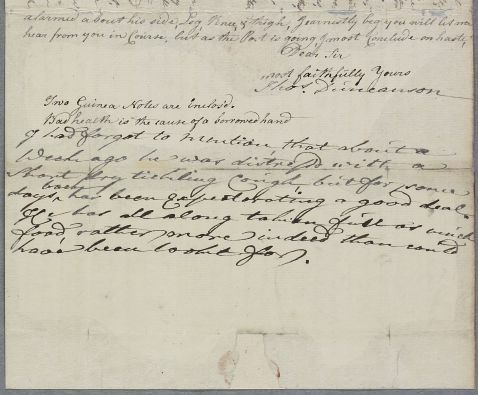 Letter from Thomas Duncanson regarding the case of Captain [Thomas] Fraser, who he first reported to Cullen in 1767, and who consulted Cullen in person at Edinburgh in 1770 [no relevant letters traced]. Since last August Fraser has taken to his bed with what may be partly imagined ailments, but has recently developed a fever. 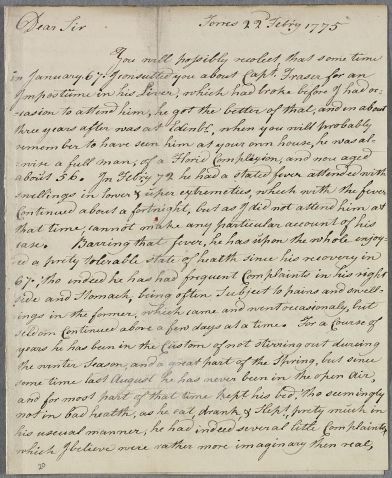 Duncanson explains that his own bad health has obliged him to dictate this letter, but he adds a note at the end himself. 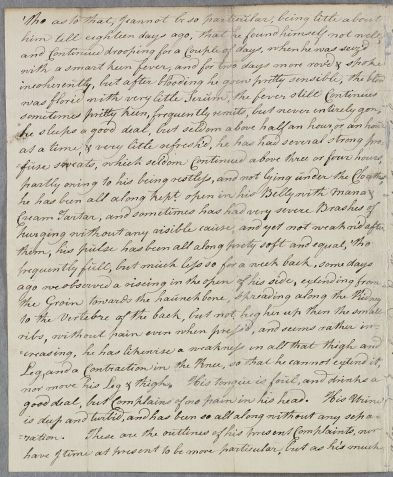 Summary Letter from Thomas Duncanson regarding the case of Captain [Thomas] Fraser, who he first reported to Cullen in 1767, and who consulted Cullen in person at Edinburgh in 1770 [no relevant letters traced]. Since last August Fraser has taken to his bed with what may be partly imagined ailments, but has recently developed a fever. 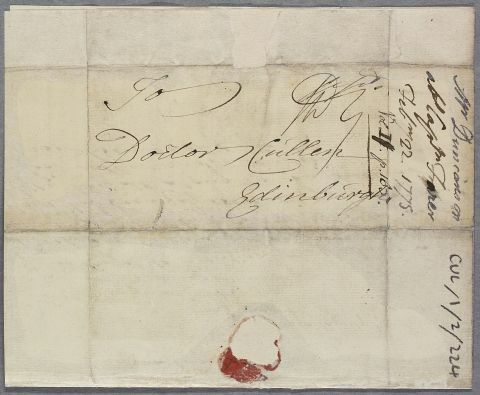 Duncanson explains that his own bad health has obliged him to dictate this letter, but he adds a note at the end himself. Two Guinea Notes are inclos'd. days ↑back↑ has been Expectorating a good deal. 1: Duncanson means that his own bad health has obliged him to dictate this letter. 2: Duncanson adds this afterthought in his own hand (see note above).